An ultra low-budget vampire flick; about a seductive female vampire, seeking a pregnant widow, and her child. The movie was written and directed by Chris Alexander; and it's a sequel/prequel to his 2012 indie vampire flick 'BLOOD FOR IRINA'. Shauna Henry once again plays Irina. I absolutely hate this movie! Irina (Henry) is a vampire; roaming the woods, and hypnotizing all that she comes into contact with (before killing them, violently). No one seems to be able to resist her deadly powers. Irina is also on a bloody mission, to find a pregnant widow (Carrie Gemmell); so she can kill her, and steal her baby. A preacher (Nivek Ogre) is also looking for Irina, with the seeming intent to stop her. The film appears to have been shot almost entirely on low quality video (some of it was even, reportedly, recorded on an iPhone). The story plays out (entirely) with no dialogue, and no character motive (or story) explained. I admire the filmmaker's creative efforts; but (for me) it doesn't work at all, here. I found the movie to be almost unbearable to sit through, and I couldn't wait for it to be over! 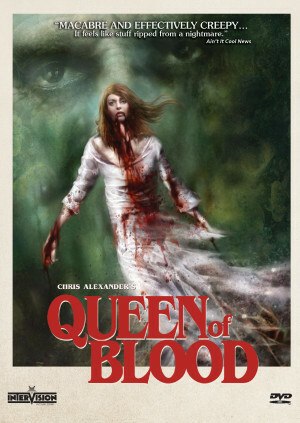 I haven't seen 'BLOOD FOR IRINA'; it is a bonus feature on the Blu-ray though, but I have absolutely no interest in seeing it (after seeing this). I will give credit to the film's score; it's very haunting and atmospheric. That's the movie's only redeemable quality, for me though.